Let’s Go Over This Again… Photography Is Not A Crime! It seems that Homeland Security has embarked on another of those “if you see something, say something” campaigns, something that has become far too popular among police agencies at all levels. And, this being 2018, they tweeted each of the of the “warning signs”, including this gem. So what’s “unusual” when it comes to photography? Many people view anyone carrying a DSLR as suspicious. Even though my six-year old Rebel makes a pretty poor spy camera. How do you determine “prolonged interest”? A good photographer will often look for different perspectives on a good subject and wait for different light, taking multiple shots along the way. Is that considered a “covert manner”? One of the worst parts of the campaign is the infographic featuring all the “warning signs”. 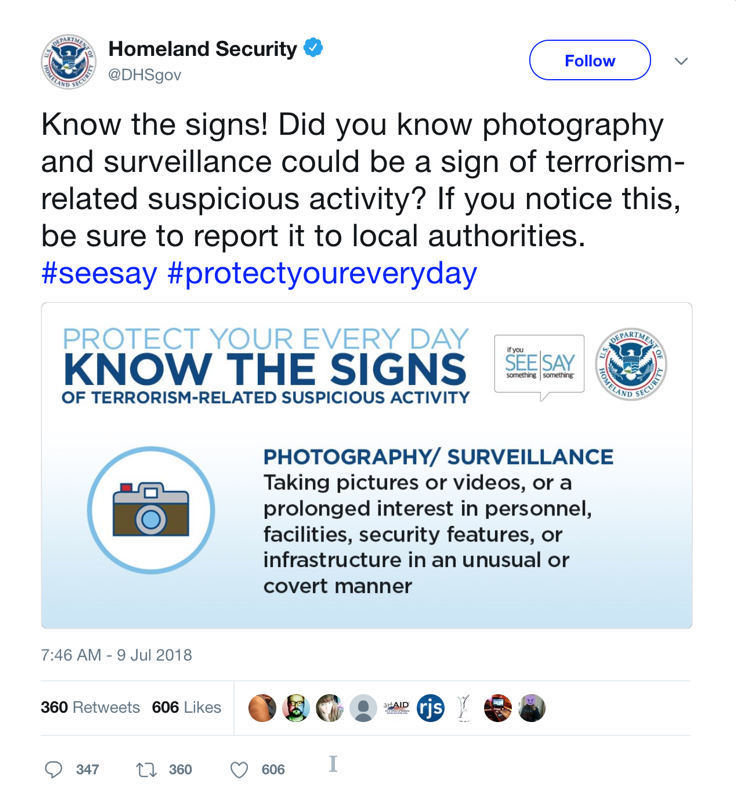 Homeland Security is placing photography on the same level with activities like theft, making threats, cyberattack, and collecting weapons. Unfortunately, attempting to restrict the right to photograph in public spaces, always in the name of security, never seems to go away, especially in the DC area. Despite court rulings, Congressional hearings on the matter, and the fact that absolutely no link has ever been established between people taking pictures and terrorist acts. Even Stephen Colbert (no, the other one) found the whole idea amusing. But you don’t think taking pictures with a smartphone exempts you from being considered “suspicious”, do you? Now would be a good time to review your rights as a photographer, regardless of your equipment. Attorney Bert Krages has created The Photographer’s Right, a pdf summary based on information from the ACLU. He’s also written a book on the subject that also goes into the legal rights and responsibilities if you plan to sell your images. If you want to dive deeper into the subject without paying, the ACLU themselves have an extensive online collection of articles and posts on the subject. Of course, this information applies to the United States. I haven’t found a lot of good resources for other countries, although many western nations provide similar rights for the art of photography. Wikimedia Commons does offer a general chart about laws regarding taking and using pictures of people in many countries. The Wikipedia article on Photography and the law, covering the UK, Canada, and other countries, is also useful. And, as you might expect, there is a great deal of controversy and uncertainty around taking pictures of law enforcement activities. Be extra cautious when practicing journalistic photography.